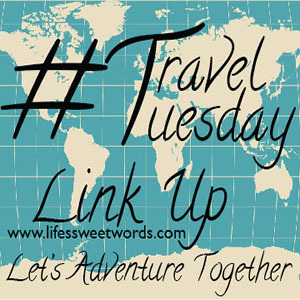 It's time for another link up, so be sure to head to the bottom of this post and add your adventures, to the blue "add your link" button, so that we can travel together! We are loving our time in the mountains right now, but this cold weather has us seriously missing some sun and sand!! I figured to fight off the chill I should finally get around to posting about our last cruise to the Bahamas. Cruising is one of our absolute favorite ways to travel! We pack up all the essentials, board the boat, and then it's smooth sailing, as we head from one tropical destination to another! We usually try to book cruises heading to places we have never been and since almost every ship we have ever been on makes a stop in the Bahamas, that's usually a day that we won't leave the boat; opting to enjoy a deserted ship to ourselves. 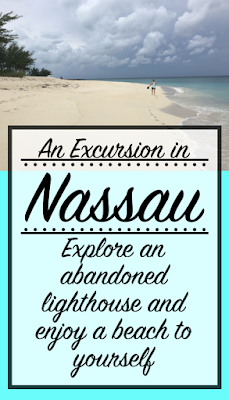 However, if you have ever sailed through Nassau, then you know that the tip of the island (as you are entering or leaving the harbor) has an abandoned lighthouse and a long stretch of gorgeous sand that just looks so inviting. Each time we would sail away, we would watch the lighthouse (Hog Island Lighthouse) get smaller and smaller and talk about how "one of these times" we were going to make it over there to explore! We finally decided that this specific trip was going to be that moment; the only challenge now was how to get over there? Often times, booking an excursion through the boat costs double what it would to book the same excursion through a third party or just go directly to the site yourself. The boat gets a large cut of what you are paying. Yes, they do arrange all transportation, but we still think it's a pretty steep service charge. Our day at the lighthouse for example cost us $40 (total), while a beach day booked through the boat is likely to cost you $55 per person. Always wanted to explore Atlantis? Did you know it's only an $8 taxi ride to get there and then you can explore a good portion of the hotel for free, as long as you aren't planning to use the beach and pools! Going to the lighthouse isn't even an excursion offered through the ship. Most cruise lines have partnerships with more of the frequently-visited, tourist-destination spots. We love getting a local or off-the-beaten path feel for a place, which isn't always offered through the boat. In a smaller port, like Nassau, there are tons of spots to walk to or if you are in a larger, open port you can always rent your own mode of transportation for the day. Cruising on the Carnival Breeze included two of our absolute favorite moments: renting a scooter in Grand Turk to explore the entire length of the island and ATVing through Arikok National Park in Aruba. Another beach to ourselves; down a trail, near the lighthouse in Grand Turk! It really pays to go-it-alone! When you plan your own excursion you set the schedule. When you book through the boat you are at the mercy of the time they delegated. You have to be up VERY early to get to your designated meeting spot and usually sit around for a while waiting for everyone in the group to gather. We LOVE the freedom to explore at our own pace. 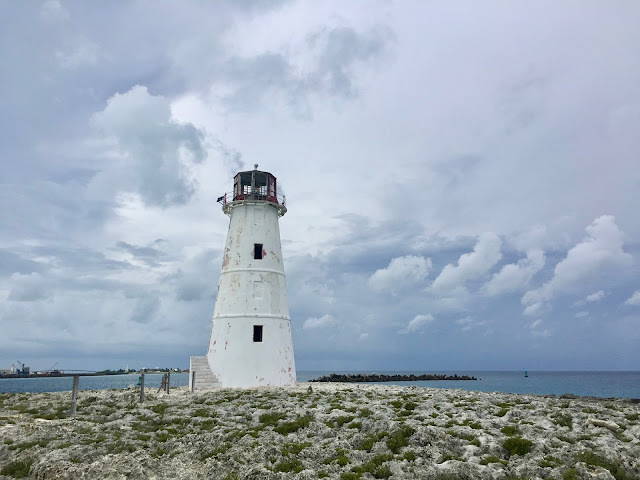 On the day we explored the lighthouse in Nassau we were able to wake up later in the morning, head into town to enjoy a beer at the new brewery, go back to the ship for lunch, and still make it over to Hog Island Lighthouse in the afternoon. Our Nassau lighthouse excursion was definitely a day full of freedom and fun! The excursions through a cruise are to well known destinations, so not only are you already on the excursion with tons of people from your own ship, chances are you will arrive at whatever destination you have planned with tons of people from other boats too. While we love engaging with others on the boat we usually have time to do that on-board. Port days are our time to really get-away-from-it-all and be just the two of us. We typically try to find less visited places. Our day at the lighthouse was exactly that, as there was not another soul on the whole beach! 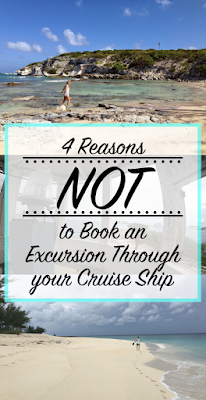 While booking your own excursion can come with risks (For example: If you are on an excursion booked through the boat and something goes wrong, which could make you late for boarding, then the ship has to wait for you. Choosing to go-it-alone means that the ship is not required to wait for you to get back on board before sailing away.) we believe they are far outweighed by the rewards! 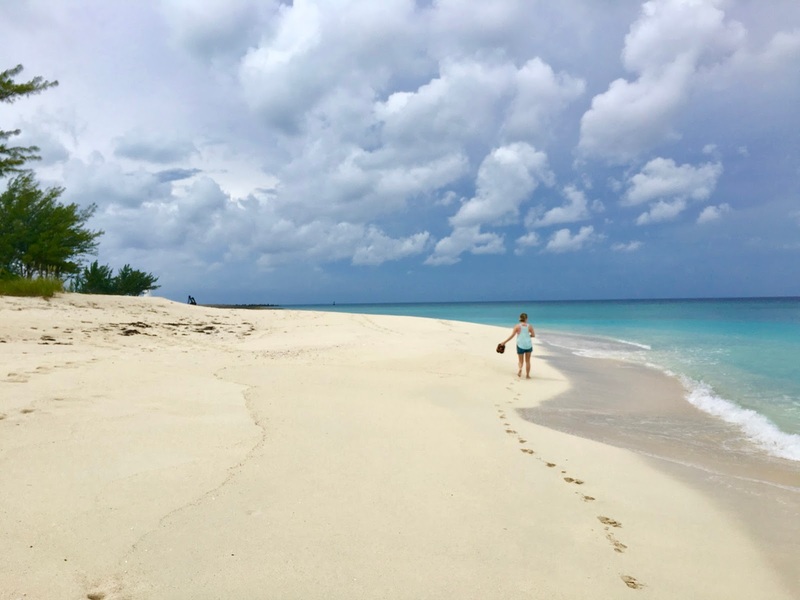 If it weren't for being willing to look outside of the cruise line's excursions we would have never had a beautifully, glorious day on "our own private beach" in the Bahamas. Where we found our driver; you can see the lighthouse off in the distance. To get there all we had to do was walk out of the cruise terminal and down to the strip that runs along the water across from the restaurants. There are typically people out there; offering parasailing trips, a boat ride over to Atlantis, or any other number of options. We knew our destination and that it was literally only a three minute boat ride across the harbor, so we set a price that we weren't willing to pay more than and went to ask someone if they could take us across. The woman running the excursion stand found Baba for us. He came over and originally offered to take us for $80, which was more than we had been willing to pay. You have to pay attention to the prices to get to other spots and base your number accordingly. It was around that price to be taken to Atlantis and back, which is much further. When we went to walk away he dropped the price down to $40- which we immediately accepted. We loaded onto the boat, Baba gave us some information on the island and then we arranged a pick up time. Baba was wonderful; letting us know to only give him half now, and then the second half on pickup (he wanted to make sure we knew he would be coming back for us). We made sure to give him a tip for being so great and ended up paying $50 total for the ride. You really can't beat $50 for a day of fun, fish, and your own private beach!! ~I will also be featuring my favorite post from the month before and sharing across social media. 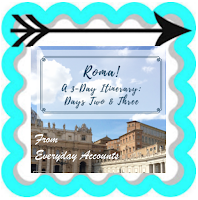 January's favorite was a gorgeous trip to Rome, from Emily at Everyday Accounts. All the food, all the history!? LOVE! Wonderful tips! My Mom's dream is to go to a lighthouse like this! A cruise is high up on my bucket list. Your private beach sounds like the perfect trip! I feel like a mother-daughter cruise to the Bahamas is in order! You can get great deals close to sail dates when they are trying to fill rooms, just have be willing to pack up and go! Planning your own excursion is definitely the smart way to go and hopefully can support the local economy. Yes!! It's why we LOVE it! Gorgeous place! We took a cruise there many years ago!! Would totally love to go back! Hope you can make it back soon! My hubby and I like to travel off the beaten path too. AND we like to save money. Thank you for these tips, I'll pin it in case we ever decide to go on a cruise. I hope you decide to give it a go, it can be a really great way to see a lot of new places... and it's often pretty inexpensive compared to going and staying in a hotel or something else at one location. Just have to work your way around it. For example, you can bring a bottle of wine on board each. I use those to make Sangria with the free lemonade they have. Then we just purchase one drink package and he uses that. Otherwise, they will get you on drinks and extras. Great suggestions! We loved our cruise, but felt the excursion booking was a total gong show. Thanks for these tips! You bet! Yes, we definitely try to steer clear of booking through the ship. The only exception is if we are in a place that doesn't recommend traveling without a guide or when we have a really tight window of time. Thanks for sharing great information. I didn't know it was more expensive. Oh yeah, WAY more expensive and the cruise line gets a huge chunk of it, rather than the local economy. Haha, he was a few minutes late, but we felt alright about it because he wouldn't get the second half if he didn't come back. Thankfully there is also the option to walk to the Atlantis and then taxi back. We made sure to leave time for that, but it would have been one heck of a long walk! I love Nassau, I need to get back! We have our first cruise as a family coming up! 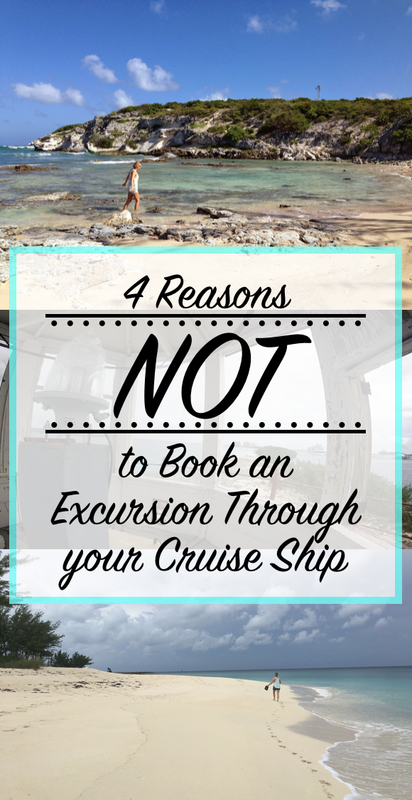 These are great tips (we arent going to Bahamas) I havent been crusing in 10 years! Ahhh, so fun!! Can't wait to see where you are going!! Any questions feel free to ask. We cruise often and know a few other tips for saving $$. Have a great time!! We don't have kiddos, but if and when we do we plan to cruise with them. Kids clubs make it a great way to travel with littles, but still get alone time too. OH I absolutely LOVE Nassau! Your photos are stunning! I totally agree, planning your own excursion gives you so much freedom and you usually stumble on something so unique! Your trip looks amazing! Great tips! I love Nassau and am about ready to book another trip there. I always prefer venturing off on my own, and rarely ever go on group tours. Last time we went we booked a half-day private fishing trip and caught lots of barracuda :) So fun! Oh my goodness! That sounds like a blast! I would love to try deep-sea fishing! I love to read about travel. Always looking for some where new to go. Love your link up. I have always wanted to go to the Bahamas! These photos are stunning!